If this church were dedicated to some martyr or confessor, I would be urging you to imitate his actions, to be like him. 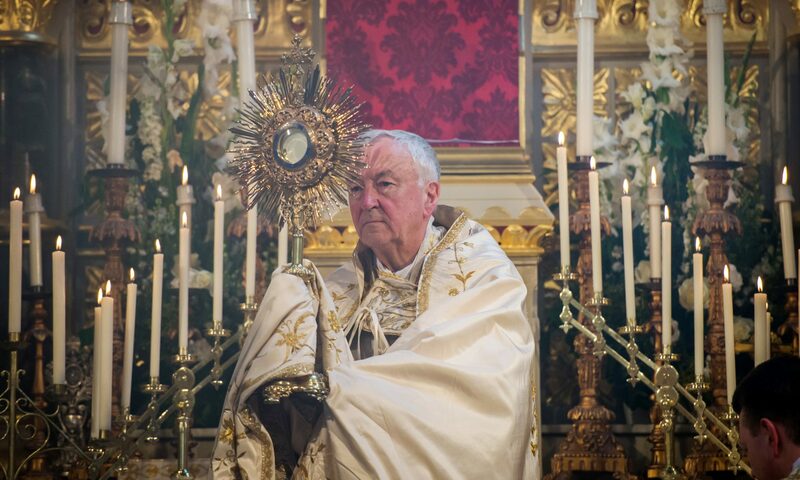 But since this church takes its title from the Blessed Sacrament, I will urge you rather to be like the Blessed Sacrament; to let Christ live in you, to let him make you the abiding dwelling-place of his presence. Pope Benedict XVI famously once said that “without the Eucharist, the Church quite simply would not exist.” It was this reality that the Reformers understood all too clearly during the reigns of King Henry VIII and Queen Elizabeth I as they sought to eradicate Catholicism from these British Isles. However, as Christ promised St. Peter, the gates of Hell would not prevail against the Church and with the re-establishment of the hierarchy in England in 1850 came not only the beginning of the re-sanctification of this land, but also acts of penance and atonement for the sins committed against Our Blessed Lord, truly present in the Blessed Sacrament. Corpus Christi was opened in 1874 by Cardinal Manning as an act of reparation for sins against the Holy Eucharist during that time and since. Over the years Corpus Christi has become a place of devotion, stillness and prayer where one can come and spend some time before the Blessed Sacrament, make one’s confession or simply light a candle for a particular intention. With a strong emphasis on beauty and tradition, the very heart of Corpus Christi’s mission is leading souls to God, who is the fullness of Beauty, Truth and Life. The church is open daily to all from around 8:00am until around 7:00pm. If anybody is ever in London and in Covent Garden, please come to Corpus Christi Church in Maiden Lane. You will get a glimpse of Heaven and an embrace of God’s mercy, peace and calmness in the midst of a busy city.